This article appears in the current issue of Creativity Portal (creativity-portal.com). If you’re not familiar with Creativity Portal, check it out- it has wonderful ideas and articles for artists, writers, teachers, and other creative people! How to use the Naming Game to empower children and foster creativity. My pig puppet greeted the kindergarten class with his usual cheerful oinking. Then he whispered in my ear. “Oh, you’re hungry? You’d like some corn?” I asked him. He nodded. 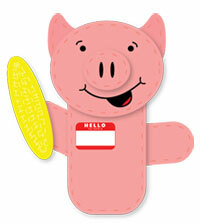 All the children held out their hands, filled with delicious imaginary corn, ready to feed the pig. I can’t recall when the puppet-feeding routine started, but for many years, this is how I’ve ended my music enrichment classes for young children. The puppet animal is usually one who had appeared in a story or song we’d enjoyed earlier. Now, generally, I’m pretty quick with silly answers to silly questions, but this one caught me off guard. My mind was a blank. But Shalini, sitting next to Aiden, was frowning thoughtfully. “No, I would name her… Princess Pig.” “Oh, I like that one too,” I responded. Before I knew it, all the children were clamoring for a turn to tell me their name for the pig puppet! “Pinky,” “Isabella,” “Piggy Wiggy,” and many others were suggested. “Those are all wonderful names!” I said. I didn’t realize it until later, but it was interesting that none of the kindergartners insisted that the whole class accept their idea as the one and only name for the puppet. They hadn’t made a contest out of it — they’d just enjoyed the fun of thinking up names. Since five-year-olds tend to turn everything into a competition, this was really remarkable. I think it was because they let themselves just get into the flow of creative thinking. The process was energizing and engaging in itself — they didn’t need an end goal. After that day, “naming the puppet” became an eagerly awaited tradition in that group’s music class for the rest of the year. And since then, I’ve used this activity with many other groups, and it’s always a favorite. Why? I’m not sure, but I do have a few hunches. First, naming puppets (or stuffed animals, or dolls) is an easy and socially acceptable way for young children to express their feelings — all kinds of feelings. They might be feeling a little aggressive (like the namer of “Sharky”) — or self-assertive, giving the puppet their own name. (One boy named a puppet “Taj 2,” like a movie sequel.) Some children feel maternal (or paternal) and give the puppet a name like “Sweetie Pie” or “Little Baby Elephant.” Some choose extravagant, “fancy” names like Lilybelle or Anastasia — the naming equivalent of playing dress-up. And some children enjoy the opportunity to be silly and whimsical, with names such as Hedgehog Flip-Flop, Pugglia, and Zoomy. When I was a child, I thought naming a doll was almost as fun as the doll itself. I’d spend days happily hemming and hawing over the perfect name. (The perfect middle name, too!) One of my sisters was totally the opposite — she named all her dolls Patty. Every single one. Like every other form of creative expression, there’s no one right way to give a toy a name — except the way you want to. Naming is also a form of pretend play, just like dressing up in princess gowns, playing house with a toy kitchen set, or “building” with a toy tool kit. Naming is something grownups do (although they don’t usually name puppets.) (Unless they’re me.) Pretend play centered around grownup activities gives young children the opportunity to explore their feelings about their parents and other adults in their lives and “practice” adult roles. There’s an educational bonus to this activity, too — naming is a way for young children to play with language and sound. For instance, I’ve found they often choose rhyming names, like Froggy Woggy. Alliteration (even though they don’t know what that word means) is popular too — names like Funny Funny Fox and Choo-Choo Chicken. They like to add silly endings, like with Chimperoo or Spiderella. And there are children who always invent completely nonsensical names like Zoozoo or Biffalo. Rhyme, alliteration and fanciful wordplay are some of the same creative tools they will use for poetry or other creative writing, and they develop these skills almost unconsciously with this game. Keep it casual. Bring in a puppet or stuffed animal, preferably in the context of a story you’ve read with the children, or something else they’re familiar with. Say something like, “Uh-oh. I forgot to name this puppet. Does anyone have any ideas?” or “Hm. What do you think would be a good name for this puppet?” Start with the children who raise their hands (or just call out), and then ask, “Anyone else?” The first few times, it’s probably better not to go around the circle and ask everyone for an idea. Some children might be more comfortable just listening until they get the hang of it and realize they don’t have to come up with a “great” idea. Remember it’s just for fun. Accept every response. (The only exception I make is for “bad words,” or mean or insulting language — then I ask the child if they can think of a nicer name.) I try to be positive and encouraging, but not overly praise-y — that can give a message that they need to invent a name that pleases me, instead of a name they like. Keep the big compliments for the entire group, at the end of the activity. Then tell them how excellent their names were, and what imaginative, creative children they are! ©2016 Abigail Flesch Connors. All rights reserved. This entry was posted in Articles, Creative Thinking, early childhood education, Uncategorized and tagged children and creativity, creative thinking, preschool, young children. Bookmark the permalink.